SoftBank Mobile Communications are striving to be the world’s number one mobile internet company. Key to Softbank’s mobile communications segment, SoftBank Mobile offer attractive mobile devices and a wide range of mobile communications services. With a sharp eye on enhancing their mobile network to make the company the number one choice of mobile providers, SoftBank Mobile continue to climb towards the number one spot amongst mobile internet service providers by maximising group synergies in a wide range of high affinity business domains and strengthening collaboration with mobile communication service companies. As well as communication services, related products and services (for example, accessories and content) are also important domains in increasing profits in the mobile internet services segment. Consolidating with associate GungHo Online Entertainment in April 2013, SoftBank was joined by Supercell, a Finnish company, in October of the same year. GungHo are the online entertainment provider responsible for the game “Puzzle and Dragons”, the 2013 rank number one game internationally. Supercell’s game, “Hay Day”, ranked number four worldwide in bestselling games in the same year. With growing user bases both in Japan and worldwide, SoftBank Mobile plan to utilise their sister companies’ market experience and intelligence to drive gains in competitiveness and profitability, with the aim of becoming the world’s premier mobile internet company. Mukesh Valabhji is a Member of SoftBank Princeville Investments. As a Member of the Advisory Board of Crimson Investment, Mr Valabhji will be following events within SoftBank Mobile with a keen interest. Provision of mobile internet and communications services in Japan. SoftBank Mobile, in order to achieve improved growth in the mobile communications industry, is working tirelessly to strengthen its mobile network, primarily through LTE upgrades. The company is looking to build on its expanding procurement and improve sales by enhancing its mobile content offerings. SoftBank Mobile view two factors as pivotal to the improvement of customer satisfaction, namely connectivity and speed. The mobile internet provider are working to expand the area of service coverage and respond to the large increase in network traffic. SoftBank Mobile switched communication services to the 900 MHz frequency in July 2012. This frequency is known as “The Platinum Band”. It offers a wider area of coverage and more efficiency. SoftBank Mobile, as a result of active capital investment, had in excess of 32,000 base stations by the end of March, 2014. The company has consistently improved data connection and call connection rates for smart phones to levels far surpassing competing mobile internet service providers. In addition to this, in response to rapidly increasing demand for high speed data connections, SoftBank Mobile are endeavouring to carry out LTE network upgrades and expand upon the number of compatible base stations, increasing these to 94,000 as of March 2014. SoftBank Mobile also hope to increase the number of Wi-Fi access points. As of 30th May 2014, the company increased Wi-Fi Spot access points to 460,000 available throughout Japan. Looking to the future, SoftBank Mobile will strive to improve mobile internet connectivity and work towards enhancing customer convenience. SoftBank Mobile appreciate the importance of next generation high speed data communication services capable of transmitting high volumes of data. Utilising the AXGP network built by Group company Wireless City Planning, SoftBank Mobile released SoftBank 4G in February 2012. SoftBank 4G boasts download speeds of up to 110 MBPS. In September of 2012 SoftBank went on to launch SoftBank4G LTE. This high speed data communication services uses FDD-LTE. SoftBank Mobile’s line up tablets and smart phones compatible with these new services continues to expand every year. SoftBank teamed with Brightstar (the world’s biggest specialised wireless distributor providing services in over 100 countries), in January 2014. Brightstar offer services such as mobile device distribution, mobile device and accessory wholesaling, mobile device insurance, inventory management and trade-in programs. SoftBank Mobile, utilising Brightstar’s international business platform, will expand its product range as well as increase the scale of the company’s mobile device and peripheral equipment procurement. In this way, SoftBank Mobile will increase in competitiveness in the United States and Japanese markets. SoftBank Corporation is an internet and telecommunications company based in Japan. The company has operations in fixed line telecommunications, broadband and internet, broadmedia, e-commerce, technology services as well as branches in finance, marketing and media. SoftBank was founded on 3rd September 1981 in Tokyo, Japan. On 14th October 2012, SoftBank acquired a 70% share of Sprint Nextel Corporation, a United States telecommunications company, for $20.1 billion. The FCC officially approved the deal on 5th July 2013 at a $5 billion capital rate on $21.6 billion, amounting to a 78% shareholding. On 6th August 2013, SoftBank completed a transaction purchasing approximately 2% in additional shares in Sprint Corporation, meaning that SoftBank by now had an 80% shareholding in the company. On 28th January 2005 SoftBank became the owner of a Japanese professional baseball team called the Fukuoka SoftBank Hawks. 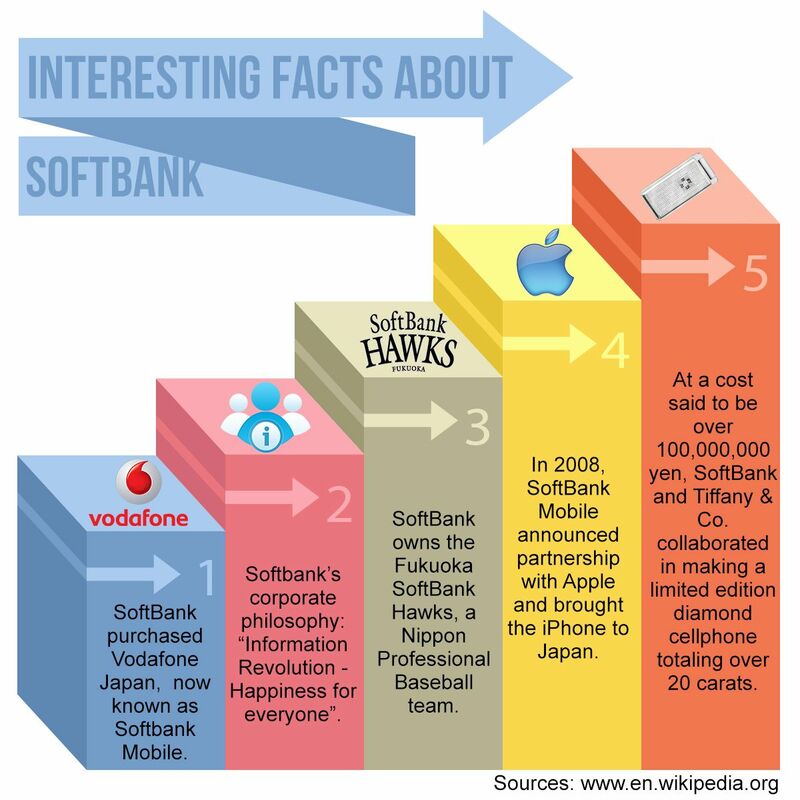 In March 2006, SoftBank struck a deal to buy Vodafone Japan. SoftBank own a 23% share in Betfair, the internet-based betting exchange, and invested $627 million in Snapdeal in 2014, acquiring a 30% stake in the company. See our next post about SoftBank Backing Online Higher Education Venture.